'A mysterious murder at the Qutub Minar triggers a call to ace journalist Chandrasekhar from his cop acquaintance, Inspector Syed Ali Hassan. The victim is unlike anyone Chandra has ever seen: a white Caucasian male who has all the looks of a throwback to Greek antiquity. Soon after, Hassan calls in to report the case has been taken away from him – in all likelihood by RAW – the Research & Analysis Wing, the uber-agency of Indian intelligence. 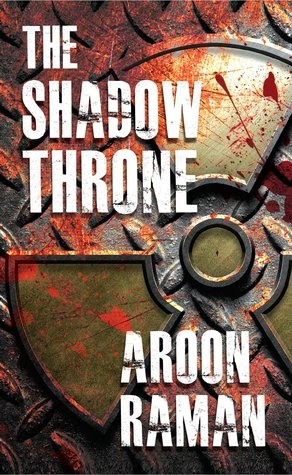 The Shadow Throne is a conspiracy thriller with a glimpse of history written by Aroon Raman. It didn’t take me too long to get intrigued by the write-up of this book – with a touch of history (including a history professor for a protagonist), a murder, cross border conspiracy and of course, with the plot also moving into Afghanistan. It had an excellent start, with the author giving the reader a full insight into the main protagonist – Chandrasekhar (whose part is narrated from a first person perspective) – a middle aged widower bereaved by the recent untimely death of his wife who is a freelance journalist based in Delhi, passionate about his profession. And once the character introduction was done, the action began in no time, with Chandra getting a call regarding an unusual murder at Qutub Minar – with the victim being one of the descendants of the ancient Indo-Greeks. But, the murder is linked to a much greater conspiracy involving multiple factions including RAW of India, Xiphos Soter (a group of Indo-Greeks in Afghanistan trying to reclaim their past glory) and the ISI of Pakistan with India facing a potential nuclear threat. It all comes down to Chandrasekhar and Syed Ali Hassan (an inspector in Delhi Police) to go all the way to Afghanistan serving both India and Pakistan and to stop the nuclear threat against all odds and are in the process helped by Meenakshi Pirzada, a history professor and a friend of Chandra’s late wife. I felt this novel had the perfect start, as aforementioned, giving an insight into the protagonist and then, straight, going on to the crux of the novel without beating about the bush. The reason why I’m a little sceptical about trying out new age Indian authors is primarily because of clichéd mundane plots being presented in sub-standard language but thankfully, I had a pleasant surprise with this novel. I enjoyed the author’s language and the description of the scenes of the novels, and thanks to his emphasis on detail, I had no issues in visualising the novel. Another great aspect of this novel is the good research – with the author having to touch up on a wide range of things, such as the border security along the Line of Control between India and Pakistan, nuclear missiles, the Indo-Greeks and their practices, the internal functioning of intelligence agencies, Afghanistan, etc. It was also great to see the character of Hassan and Chandra develop so well during the course of the novel bringing out the complexities so well. However, the best part I felt about this novel was, that despite all the write-up, Pakistan / ISI is not the enemy. When I initially read the publisher’s write-up, I thought it was one of those Pakistan bashing stories which sell so well in India (not sure about books, certainly in films) but thankfully, it wasn’t and in fact, it was pleasing to see such collaboration that one would just hope for it to happen outside a work of fiction, too. However, despite all the positives, one disappointing thing about the novel was that the Afghan setting, in my opinion wasn’t utilised well enough. I’d have enjoyed the novel a lot more had the author touched more upon the surroundings at Ghazni and the journey to Bamiyan, even if it had extended the novel by another twenty pages. While the character development of Hassan and Chandra was excellent, at the same time, Meenakshi could’ve been given some attention too as I could never connect with her very much, as a reader – seemed more like one of those sundry characters who give a couple of vital clues and just fade out. While I read comparisons of this with Dan Brown, I wouldn’t stop at that, I also found an element of Henry Rider Haggard in his work, regarding a lost race with huge dreams and touch of Alistair MacLean, as far as the action (and needless to say, the protagonist surviving against the unlikeliest of odds). It was pleasing to read such an excellent piece of work from a modern Indian author and I wish to read more of his works. To summarise, this is a fabulous debut and I wish to read more of his works. Considering the plot, the pace, the language, the character development and the research involved to put together the 320 page ‘page-turner’, I’d give this book an eight in my scale. ‘Sean Ryan is horrified to learn that his colleague and friend Alek Zegliwski has been savagely beheaded. His body is found hidden near the sacred archaeological site of Hagia Sophia in Istanbul. When Sean arrives in city to identify the body, he is handed an envelope of photographs belonging to Alek and soon finds himself in grave danger. Someone wants him dead – by why? 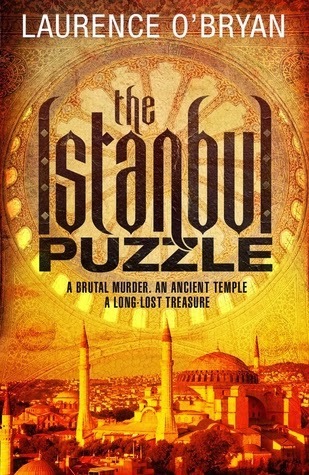 The Istanbul Puzzle is the first novel in Laurence O’Bryan’s Puzzle series featuring Sean Ryan, a widower working at The Institute of Applied Research, Oxford. It begins with the murder of Alek Zegliwski, an employee at the Institute of Applied Research, Oxford. The murder attracted a lot of attention considering how he was beheaded in Hagia Sophia. This brings his closest acquaintance into the scene, Sean Ryan, the director of the institute and by entering the scene; he ends up risking his own life as Alek’s assailants are willing to do anything to let the murder remain a mystery. However, this doesn’t worry Sean in anyway whatsoever, and is equally determined to unravel the mystery behind his colleague’s death and is helped by British diplomat in the process. The story is narrated by Sean in first person (his parts). A one liner I’d say for this book is that the write-up on the back-cover flatters to deceive. While it starts very well, with a barbaric beheading followed by Sean Ryan urgently heading to Istanbul to investigate the scene and ends up getting attacked on the same day with Isabel coming to his rescue. However, with that, everything came to an end. The author was too much in awe of Hagia Sophia, the friendly nature of the Turkish public and Hagia Sophia and ends up describing every brick of the city with such details that he gets lost in proceeding with the plot. In fact, the sub-plot on the planning of the bio-war turned out to be much more interesting and considering the end, I’m in a dilemma as to decide which is the plot – Alek’s murder or the sub-plot describer here but owing to the number of pages occupied by the former, I’d advisedly use that description for the latter. It gets nowhere till Sean and Isabel find an ancient manuscript beneath Hagia Sophia, giving a glimmer of hope to the reader that things are going to get interesting from thereon but then, it flattered to deceive too, like the overall write-up and in fact, the find had no real impact in the story, in the end. However, some praise worthy aspects of the novel are is the description of Istanbul as aforementioned. Upon reading this, your urge to visit the city where the cultures of East and West merge would just be on the rise considering the picturesque descriptions of the various monuments such as Hagia Sophia, Topkapi Palace and Hagia Eirene (though I don’t know why the Blue Mosque was completely ignored) and the Bosphorous. In fact, I’d rate it as a good travelogue with a story in the background. The way in which the author brought out the rising trust between Sean and Isabel was also good – rather than putting up with another love at first sight, Isabel falls only out of growing respect for Sean and also made a good combination together considering Sean’s tenacious and Isabel’s pragmatic approach. However, while I found the coordination between Sean and Isabel to be praise worthy, however, I felt that as a reader, I couldn’t involve myself with any of the characters individually and in fact, Sean was even quite ignorant (well, how could someone be totally in the dark about a mass demonstration that was going to take place in his city of residence, especially with it being reported in the news for so many days). Moreover, the number of loose ends were a way too many beyond the tolerable limit for a thriller – just to name a few; the search at Sean’s house in Fulham – who did it and why was it done? Ultimately, it had no impact on the plot, either. The visit to Iraq is quite similar where they find no significant lead and the only result of it was the death of the Greek Orthodox priest (not to mention, there were several other similar pointless deaths – such as… well, nearly every acquaintance of Sean in Turkey). And to top it all, this list isn’t even exhaustive. Perhaps, the only justification for the loose ends is that there is a sequel but I guess following this, I’m hardly motivated to read it, following this novel. While I had been reading that this work could be compared to that of Dan Brown’s, it inevitably led to a huge disappointment as it wasn’t even half as good as The Da Vinci Code with the only similarity being the occurrence of a murder in the prologue and historic references to happenings during an ancient era. I had very high hopes on the author’s work myself considering his tweets and the contents he shared in his blog that I was too keen to only read a story of his; only to be deceived, in the end. To my fellow readers – don’t read this expecting a The Da Vinci Code style thriller – have your expectations really low. I had been looking for this novel for a really long time and considering the scarce availability of it in my country of residence, I bought it from a neighbouring country and considering my expectations, the effort I took in hunting for this novel, and it was a huge disappointment. I hope something better in the sequel, in case I find the sudden motivation to read it. I’d be generous enough to award The Istanbul Puzzle a 4/10 (only for the description of Istanbul).